Heavy duty soap dishes and tumbler holders are available with a variety of optional features and mounting systems. The recessed soap dish/tumbler holder is fabricated from 20 gauge Type 304 Series stainless steel. It is drawn and therefore is a one-piece seamless fabrication. Additional features available are the lip (to assist with retention of the enclosed objects) and a bar (for additional gripping functionality). The recessed soap dish and tumbler assembly has an exposed face that is 5" by 7-1/8" with an inside dimension of 5-5/8" by 3-3/8" by 2-1/2" deep and is available with a satin or bright polished finish. 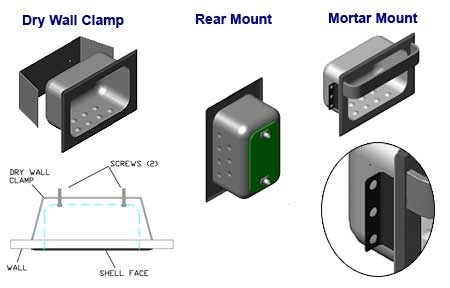 The diagram above shows the variety of mounting options available. The table below differentiates part numbers by attributes.